The noted Sioux warrior, Rain-in-the-Face, whose name once carried terror to every part of the frontier, died at his home on the Standing Rock reserve in North Dakota on September 14, 1905. About two months before his death I went to see him for the last time, where he lay upon the bed of sickness from which he never rose again, and drew from him his life-history. It had been my experience that you cannot induce an Indian to tell a story, or even his own name, by asking him directly. "Friend," I said, "even if a man is on a hot trail, he stops for a smoke! In the good old days, before the charge there was a smoke. At home, by the fireside, when the old men were asked to tell their brave deeds, again the pipe was passed. So come, let us smoke now to the memory of the old days!" He took of my tobacco and filled his long pipe, and we smoked. Then I told an old mirthful story to get him in the humor of relating his own history. The old man lay upon an iron bedstead, covered by a red blanket, in a corner of the little log cabin. He was all alone that day; only an old dog lay silent and watchful at his master's feet. "True, friend; it is the old custom to retrace one's trail before leaving it forever! I know that I am at the door of the spirit home. "I was born near the forks of the Cheyenne River, about seventy years ago. My father was not a chief; my grandfather was not a chief, but a good hunter and a feast-maker. On my mother's side I had some noted ancestors, but they left me no chieftainship. I had to work for my reputation. "When I was a boy, I loved to fight," he continued. "In all our boyish games I had the name of being hard to handle, and I took much pride in the fact. "Afterwards, when I was a young man, we went on a warpath against the Gros Ventres. We stole some of their horses, but were overtaken and had to abandon the horses and fight for our lives. I had wished my face to represent the sun when partly covered with darkness, so I painted it half black, half red. We fought all day in the rain, and my face was partly washed and streaked with red and black: so again I was christened Rain-in-the-Face. We considered it an honorable name. "I had been on many warpaths, but was not especially successful until about the time the Sioux began to fight with the white man. One of the most daring attacks that we ever made was at Fort Totten, North Dakota, in the summer of 1866. "Hohay, the Assiniboine captive of Sitting Bull, was the leader in this raid. Wapaypay, the Fearless Bear, who was afterward hanged at Yankton, was the bravest man among us. He dared Hohay to make the charge. Hohay accepted the challenge, and in turn dared the other to ride with him through the agency and right under the walls of the fort, which was well garrisoned and strong. "Wapaypay and I in those days called each other 'brother-friend.' It was a life-and-death vow. What one does the other must do; and that meant that I must be in the forefront of the charge, and if he is killed, I must fight until I die also! "I prepared for death. I painted as usual like an eclipse of the sun, half black and half red." His eyes gleamed and his face lighted up remarkably as he talked, pushing his black hair back from his forehead with a nervous gesture. "Now the signal for the charge was given! I started even with Wapaypay, but his horse was faster than mine, so he left me a little behind as we neared the fort. This was bad for me, for by that time the soldiers had somewhat recovered from the surprise and were aiming better. "Their big gun talked very loud, but my Wapaypay was leading on, leaning forward on his fleet pony like a flying squirrel on a smooth log! He held his rawhide shield on the right side, a little to the front, and so did I. Our warwhoop was like the coyotes singing in the evening, when they smell blood! "The soldiers' guns talked fast, but few were hurt. Their big gun was like a toothless old dog, who only makes himself hotter the more noise he makes," he remarked with some humor. "How much harm we did I do not know, but we made things lively for a time; and the white men acted as people do when a swarm of angry bees get into camp. We made a successful retreat, but some of the reservation Indians followed us yelling, until Hohay told them that he did not wish to fight with the captives of the white man, for there would be no honor in that. There was blood running down my leg, and I found that both my horse and I were slightly wounded. "Some two years later we attacked a fort west of the Black Hills [Fort Phil Kearny, Wyoming]. It was there we killed one hundred soldiers." [The military reports say eighty men, under the command of Captain Fetterman�not one left alive to tell the tale!] "Nearly every band of the Sioux nation was represented in that fight�Red Cloud, Spotted Tail, Crazy Horse, Sitting Bull, Big Foot, and all our great chiefs were there. Of course such men as I were then comparatively unknown. However, there were many noted young warriors, among them Sword, the younger Young-Man-Afraid, American Horse [afterward chief], Crow King, and others. "This was the plan decided upon after many councils. The main war party lay in ambush, and a few of the bravest young men were appointed to attack the woodchoppers who were cutting logs to complete the building of the fort. We were told not to kill these men, but to chase them into the fort and retreat slowly, defying the white men; and if the soldiers should follow, we were to lead them into the ambush. They took our bait exactly as we had hoped! It was a matter of a very few minutes, for every soldier lay dead in a shorter time than it takes to annihilate a small herd of buffalo. "This attack was hastened because most of the Sioux on the Missouri River and eastward had begun to talk of suing for peace. But even this did not stop the peace movement. The very next year a treaty was signed at Fort Rice, Dakota Territory, by nearly all the Sioux chiefs, in which it was agreed on the part of the Great Father in Washington that all the country north of the Republican River in Nebraska, including the Black Hills and the Big Horn Mountains, was to be always Sioux country, and no white man should intrude upon it without our permission. Even with this agreement Sitting Bull and Crazy Horse were not satisfied, and they would not sign. "Up to this time I had fought in some important battles, but had achieved no great deed. I was ambitious to make a name for myself. I joined war parties against the Crows, Mandans, Gros Ventres, and Pawnees, and gained some little distinction. "It was when the white men found the yellow metal in our country, and came in great numbers, driving away our game, that we took up arms against them for the last time. I must say here that the chiefs who were loudest for war were among the first to submit and accept reservation life. Spotted Tail was a great warrior, yet he was one of the first to yield, because he was promised by the Chief Soldiers that they would make him chief of all the Sioux. Ugh! he would have stayed with Sitting Bull to the last had it not been for his ambition. "About this time we young warriors began to watch the trails of the white men into the Black Hills, and when we saw a wagon coming we would hide at the crossing and kill them all without much trouble. We did this to discourage the whites from coming into our country without our permission. It was the duty of our Great Father at Washington, by the agreement of 1868, to keep his white children away. "During the troublesome time after this treaty, which no one seemed to respect, either white or Indian [but the whites broke it first], I was like many other young men�much on the warpath, but with little honor. I had not yet become noted for any great deed. Finally, Wapaypay and I waylaid and killed a white soldier on his way from the fort to his home in the east. "There were a few Indians who were liars, and never on the warpath, playing 'good Indian' with the Indian agents and the war chiefs at the forts. Some of this faithless set betrayed me, and told more than I ever did. I was seized and taken to the fort near Bismarck, North Dakota [Fort Abraham Lincoln], by a brother [Tom Custer] of the Long-Haired War Chief, and imprisoned there. These same lying Indians, who were selling their services as scouts to the white man, told me that I was to be shot to death, or else hanged upon a tree. I answered that I was not afraid to die. "When he had made me understand, you may guess that I ran my best! I was almost over the bank when he fired his piece at me several times, but I had already gained cover and was safe. I have never told this before, and would not, lest it should do him an injury, but he was an old man then, and I am sure he must be dead long since. That old soldier taught me that some of the white people have hearts," he added, quite seriously. "I went back to Standing Rock in the night, and I had to hide for several days in the woods, where food was brought to me by my relatives. The Indian police were ordered to retake me, and they pretended to hunt for me, but really they did not, for if they had found me I would have died with one or two of them, and they knew it! In a few days I departed with several others, and we rejoined the hostile camp on the Powder River and made some trouble for the men who were building the great iron track north of us [Northern Pacific]. "In the spring the hostile Sioux got together again upon the Tongue River. It was one of the greatest camps of the Sioux that I ever saw. There were some Northern Cheyennes with us, under Two Moon, and a few Santee Sioux, renegades from Canada, under Inkpaduta, who had killed white people in Iowa long before. We had decided to fight the white soldiers until no warrior should be left." At this point Rain-in-the-Face took up his tobacco pouch and began again to fill his pipe. "Of course the younger warriors were delighted with the prospect of a great fight! Our scouts had discovered piles of oats for horses and other supplies near the Missouri River. They had been brought by the white man's fire-boats. Presently they reported a great army about a day's travel to the south, with Shoshone and Crow scouts. "There was excitement among the people, and a great council was held. Many spoke. I was asked the condition of those Indians who had gone upon the reservation, and I told them truly that they were nothing more than prisoners. It was decided to go out and meet Three Stars [General Crook] at a safe distance from our camp. "We met him on the Little Rosebud. I believe that if we had waited and allowed him to make the attack, he would have fared no better than Custer. He was too strongly fortified where he was, and I think, too, that he was saved partly by his Indian allies, for the scouts discovered us first and fought us first, thus giving him time to make his preparations. I think he was more wise than brave! After we had left that neighborhood he might have pushed on and connected with the Long-Haired Chief. That would have saved Custer and perhaps won the day. "When we crossed from Tongue River to the Little Big Horn, on account of the scarcity of game, we did not anticipate any more trouble. Our runners had discovered that Crook had retraced his trail to Goose Creek, and we did not suppose that the white men would care to follow us farther into the rough country. 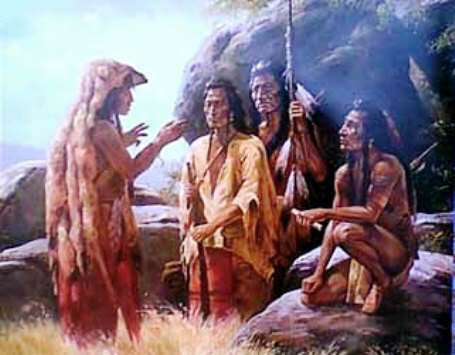 "Suddenly the Long-Haired Chief appeared with his men! It was a surprise." "What part of the camp were you in when the soldiers attacked the lower end?" I asked. "I had been invited to a feast at one of the young men's lodges [a sort of club]. There was a certain warrior who was making preparations to go against the Crows, and I had decided to go also," he said. "While I was eating my meat we heard the war cry! We all rushed out, and saw a warrior riding at top speed from the lower camp, giving the warning as he came. Then we heard the reports of the soldiers' guns, which sounded differently from the guns fired by our people in battle. "I ran to my teepee and seized my gun, a bow, and a quiver full of arrows. I already had my stone war club, for you know we usually carry those by way of ornament. Just as I was about to set out to meet Reno, a body of soldiers appeared nearly opposite us, at the edge of a long line of cliffs across the river. "All of us who were mounted and ready immediately started down the stream toward the ford. There were Ogallalas, Minneconjous, Cheyennes, and some Unkpapas, and those around me seemed to be nearly all very young men. "'Behold, there is among us a young woman!' I shouted. 'Let no young man hide behind her garment!' I knew that would make those young men brave. "The woman was Tashenamani, or Moving Robe, whose brother had just been killed in the fight with Three Stars. Holding her brother's war staff over her head, and leaning forward upon her charger, she looked as pretty as a bird. Always when there is a woman in the charge, it causes the warriors to vie with one another in displaying their valor," he added. "The foremost warriors had almost surrounded the white men, and more were continually crossing the stream. The soldiers had dismounted, and were firing into the camp from the top of the cliff." "My friend, was Sitting Bull in this fight?" I inquired. "I did not see him there, but I learned afterward that he was among those who met Reno, and that was three or four of the white man's miles from Custer's position. Later he joined the attack upon Custer, but was not among the foremost. "When the troops were surrounded on two sides, with the river on the third, the order came to charge! There were many very young men, some of whom had only a war staff or a stone war club in hand, who plunged into the column, knocking the men over and stampeding their horses. "The soldiers had mounted and started back, but when the onset came they dismounted again and separated into several divisions, facing different ways. They fired as fast as they could load their guns, while we used chiefly arrows and war clubs. There seemed to be two distinct movements among the Indians. One body moved continually in a circle, while the other rode directly into and through the troops. "Presently some of the soldiers remounted and fled along the ridge toward Reno's position; but they were followed by our warriors, like hundreds of blackbirds after a hawk. A larger body remained together at the upper end of a little ravine, and fought bravely until they were cut to pieces. I had always thought that white men were cowards, but I had a great respect for them after this day. "It is generally said that a young man with nothing but a war staff in his hand broke through the column and knocked down the leader very early in the fight. We supposed him to be the leader, because he stood up in full view, swinging his big knife [sword] over his head, and talking loud. Some one unknown afterwards shot the chief, and he was probably killed also; for if not, he would have told of the deed, and called others to witness it. So it is that no one knows who killed the Long-Haired Chief [General Custer]. "There was an Indian here called Appearing Elk, who died a short time ago. He was slightly wounded in the charge. He had some of the weapons of the Long-Haired Chief, and the Indians used to say jokingly after we came upon the reservation that Appearing Elk must have killed the Chief, because he had his sword! However, the scramble for plunder did not begin until all were dead. I do not think he killed Custer, and if he had, the time to claim the honor was immediately after the fight. "Many lies have been told of me. Some say that I killed the Chief, and others that I cut out the heart of his brother [Tom Custer], because he had caused me to be imprisoned. Why, in that fight the excitement was so great that we scarcely recognized our nearest friends! Everything was done like lightning. After the battle we young men were chasing horses all over the prairie, while the old men and women plundered the bodies; and if any mutilating was done, it was by the old men. "I have lived peaceably ever since we came upon the reservation. No one can say that Rain-in-the-Face has broken the rules of the Great Father. I fought for my people and my country. When we were conquered I remained silent, as a warrior should. Rain-in-the-Face was killed when he put down his weapons before the Great Father. His spirit was gone then; only his poor body lived on, but now it is almost ready to lie down for the last time. Ho, hechetu! [It is well.]" This story of Rain in the Face is featured in the book entitled Indian Heroes and Great Chieftains by Charles A. Eastman which was published by Little, Brown and Company, Boston in 1918.